When you flip through the pages of magazines, it is obvious that there is a baby boom amongst celebrities. Famous and much admired women are proudly showing their pregnant forms and looking as chic as ever in stylish and on-trend maternity wear. In fact, many pregnant women are rightfully inspired by the ability of current and recently pregnant celebrities such as: Beyonce, Jessica Alba, Kate Hudson and Victoria Beckham to look as well styled, polished and fashionable as they always have. So, what looks have these celebrities sported that work well? Traditionally and historically likened to your grandmother’s swimming costume, maternity versions have long been unappealing and very unflattering. The great news is that contemporary maternity swimwear is on-trend, stylish and attractive. When a pregnant woman wears bathers that she at least finds fashionable, she is more likely to feel good about herself and her body. Celebrities are proving to us all that pregnancy is not necessarily a time to conceal, but a time to celebrate your pregnant body. During her pregnancies, Jennifer Garner has looked fantastic in various bottoms (including leggings and jeggings) that include bands which rise above the belly. Not only do such pants increase comfort and support your belly, they create smooth lines under all sorts of tops – from tight fitting t-shirts to cotton shirts. Many women agree that maternity jeans are a crucial inclusion to your maternity wear. Celebrities such as Dannii Minogue have agreed with this and made great use of jeans in contemporary and attractive styles to enhance their maternity wardrobe. Maternity jeans can be surprisingly comfortable and dressed up or down. As with a variety of pants and skirts, maternity jeans often feature supportive and comfortable bands or low waisted, adjustable button arrangements. Far from being tent-like and shapeless, modern maxi, or long, dresses have been seen on many pregnant celebrities. Nicole Richie is one such celebrity who has looked fantastic and extremely comfortable in a long, flowing dress. Such dresses are particularly wearable and attractive because they are available in a range of attractive colours and prints that are definitely fashionable and reflective of current trends. Well-cut and well-crafted dresses will enhance the form and move beautifully on the body of a pregnant woman…celebrity or not. No matter what garments you are sporting, any outfit can be enhanced and made more fashionable through the use of gorgeous accessories. Jessica Alba and Nicole Richie have looked amazing adorned with long necklaces, beads and bangles, while Victoria Beckham has used bags and her trademark varieties of sunglasses to add interest to her maternity wear. There really are no rules or limits – scarves, jewellery, bags, belts and other accessories can be effectively used to enhance maternity wear of all descriptions and are an easy way to maintain your own sense of style. Just as we look to celebrities for fashion ideas when we are not pregnant, expectant celebrities continue to show us that it is possible to stay fashionable and chic in spite of your growing belly and changing body. In fact, some of the world’s most beautiful and stylish women have shown that pregnancy is a time to extend your interest in fashion and celebrate this special time of your life. The idea of traveling while pregnant can feel a little daunting which is completely natural however if you plan your trip properly and get the right advice then you should enjoy your break without any hassles. 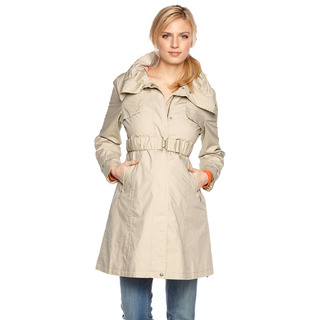 Here are our top 3 coats for dressing your bump against the rain. How Do You Want to Spend Your Babymoon? There’s no denying that life changes a lot when a new baby comes along, with lots of new things to adjust to.